Eurasian Journal of Soil Science are under the scientific control of their Editorial Board whose members are recognized experts in the subject areas included within the journal’s scope. Some executive roles of the Editorial Board members are delegated to the Editor(s)-in-Chief who is well-known in the journal’s scope. Decision about submitted manuscript to Eurasian Journal of Soil Science is based only on its importance, originality, clarity, and relevance to the journal’s scope and content. Studies with negative results despite adequate power, or those challenging previously published work receive equal consideration. Eurasian Journal of Soil Science Editorial Team has the responsibility to edit the accepted manuscripts before publishing to prevent potential falsifications and consistency of structural principles. If a published paper is subsequently found to have errors or major flaws, Eurasian Journal of Soil Science Editorial Team take responsibility for promptly correcting the written record in the journal. The specific content of the correction may address whether the errors originated with the author or the journal. The correction is listed in the table of contents to ensure that it is linked to the article to which it pertains in public databases (e.g., DOAJ, EBSCO, Proquest, etc.). Ratings of review quality and other performance characteristics of editors are periodically assessed to assure optimal journal performance, and contribute to decisions on reappointment. Individual performance data must be confidential. These performance measures are also used to assess changes in process that might improve journal performance. The handling of manuscripts that may represent a conflict of interest for editors is described under the section on conflict of interest. Protecting the confidentiality of human subjects. Take responsibility for improving the level of scientific investigation and writing in the larger community of potential authors and readers. Separating the editorial and business functions of the journal. Authorship is a way of making explicit both credit and responsibility for the contents of published articles. Credit and responsibility are inseparable. The guiding principle for authorship decisions is to present an honest account of what took place. Criteria for authorship apply to all intellectual products, including electronic publications of words, data, and images. Eurasian Journal of Soil Science should make their own policies on authorship transparent and accessible. - Performing technical services, translating text, supplying materials, and providing funding or administrative oversight over facilities where the work was done are not, in themselves, sufficient for authorship, although these contributions may be acknowledged in the manuscript. - Editors and readers need to be confident that authors have undertaken the work described and have ensured that the manuscript accurately reflects their work, irrespective of whether they took the lead in writing or sought assistance from a writer in the field. Ethical standards for publication exist to ensure the quality of the scientific publications. Eurasian Journal of Soil Science published by The Federation of Eurasian Soil Science Societies are committed to publishing only original manuscripts and work that has neither been published elsewhere (nor is under review elsewhere). So, it is critical to avoid some specific ethical violations (like plagiarism, simultaneous submission, data fabrication, duplicate publication, improper author contribution, citation manipulation). Plagiarism: Plagiarism is deliberately using someone else’s ideas, or other original material without acknowledging its source and without refer to him/her. Copying even small part ( for example one sentence) from someone else’s manuscript, or even one of your own that has previously been published, without proper citation is considered plagiarism. Simultaneous Submission: Simultaneous submission occurs when a manuscript is submitted to a journal when it is already under consideration by another journal. Data Fabrication and Falsification: Data fabrication and falsification means the researcher did not actually do the study, but made up the results and had recorded or reported the fabricated information. Data falsification means the researcher did the experiment, but manipulated, changed, or omitted data or results from the research findings. This would lead to public distrust and less willing to provide funding support. Duplicate Publication: Duplicate publication occurs when two or more papers, without full cross referencing, share the same hypotheses, data and conclusions. Improper Author Contribution: All listed authors must have made a significant contribution to the research in the paper. Citation Manipulation: Citation Manipulation is including excessive citations, in the submitted manuscript, that do not contribute to the content of the article and have been included solely for the purpose of increasing citations to a given author’s work, or to articles published in a particular journal. Process for identification of and dealing with allegations of research misconduct: Editors of Eurasian Journal of Soil Science are reasonable to identify and prevent the publication of papers where research misconduct has occurred, including plagiarism, citation manipulation, and data falsification/fabrication, among others. In doing so, Eurasian Journal of Soil Science follows COPE’s guidelines in dealing with allegations. - The editör(s)-in-chief is responsible for deciding which of the articles submitted to the journal should be published. - The editors may be guided by the policies of the journal’s editorial board and constrained by such legal requirements as shall then be in force regarding libel, copyright infringement and plagiarism. The editor may confer with other editors or reviewers in making this decision. - An editor at any time evaluate manuscripts for their intellectual content without regard to race, gender, sexual orientation, religious belief, ethnic origin, citizenship, or political philosophy of the authors. - The editor and any editorial staff must not disclose any information about a submitted manuscript to anyone other than the corresponding author, reviewers, potential reviewers, other editorial advisers, and the publisher, as appropriate. - Unpublished materials disclosed in a submitted manuscript must not be used in an editor’s own research without the express written consent of the author. - Peer review assists the editor in making editorial decisions and through the editorial communications with the author may also assist the author in improving the paper. - Reviewers should identify relevant published work that has not been cited by the authors. Any statement that an observation, derivation, or argument had been previously reported should be accompanied by the relevant citation. A reviewer should also call to the editor’s attention any substantial similarity or overlap between the manuscript under consideration and any other published paper of which they have personal knowledge. - Privileged information or ideas obtained through peer review must be kept confidential and not used for personal advantage. Reviewers should not consider manuscripts in which they have conflicts of interest resulting from competitive, collaborative, or other relationships or connections with any of the authors, companies, or institutions connected to the papers. - Authors are asked to provide the raw data in connection with a paper for editorial review, and should be prepared to provide public access to such data (consistent with the ALPSP-STM Statement on Data and Databases), if practicable, and should in any event be prepared to retain such data for a reasonable time after publication. - The authors should ensure that they have written entirely original works, and if the authors have used the work and/or words of others that this has been appropriately cited or quoted. - An author should not in general publish manuscripts describing essentially the same research in more than one journal or primary publication. Submitting the same manuscript to more than one journal concurrently constitutes unethical publishing behavior and is unacceptable. - Proper acknowledgment of the work of others must always be given. Authors should cite publications that have been influential in determining the nature of the reported work. - Authorship should be limited to those who have made a significant contribution to the conception, design, execution, or interpretation of the reported study. All those who have made significant contributions should be listed as co-authors. Where there are others who have participated in certain substantive aspects of the research project, they should be acknowledged or listed as contributors. - The corresponding author should ensure that all appropriate co-authors and no inappropriate co-authors are included on the paper, and that all co-authors have seen and approved the final version of the paper and have agreed to its submission for publication. - If the work involves chemicals, procedures or equipment that have any unusual hazards inherent in their use, the author must clearly identify these in the manuscript. - All authors should disclose in their manuscript any financial or other substantive conflict of interest that might be construed to influence the results or interpretation of their manuscript. All sources of financial support for the project should be disclosed. Federation of Eurasian Soil Science Societies (FESSS) has tried to make a practical division between the policy-makers of services/researches and the scientific decision-makers of scholarly materials. In FESSS opinion, this is an important issue which should not be neglected by the Eurasian Journal of Soil Science management systems; because it can lead to low quality outputs and deviates the way of science. FESSS has tried to resist against all parameters which conflict with these principles and also make all the participants of scholarly material production aware of the consequences of deviation from these principles. - The conditions of the editors-in-chief’s employment, including authority, responsibilities, term of appointment, and mechanisms for resolving conflict, should be explicitly stated and approved by both editor and owners before the editor is appointed. - Editors-in-chief should have full authority over the editorial content of the journal, generally referred to as "editorial independence." Owners should not interfere in the evaluation, selection, or editing of individual articles, either directly or by creating an environment in which editorial decisions are strongly influenced. - Editorial decisions should be based mainly on the validity of the work and its importance to readers, not the commercial success of the journal. Editors should be free to express critical but responsible views about all aspects of science without fear of retribution, even if these views might conflict with the commercial goals of the publisher. To maintain this position, editors should seek input from a broad array of advisors, such as reviewers, editorial staff, an editorial board, and readers. - Editors-in-chief should establish procedures that guard against the influence of commercial and personal self-interest on editorial decisions. - Owners have the right to hire and fire editors-in-chief, but they should dismiss them only for substantial reasons, such as a pattern of irresponsible editorial decisions, scientific misconduct, disagreement with the long-term editorial direction of the journal, or personal behavior (such as criminal acts), that are incompatible with a position of trust. Furthermore it is preferable that any evaluation on which hiring or firing is based should be performed by a panel of independent experts, rather than a small number of executives of the owning organization. - Editors-in-chief should report to the highest governing body of the owning organization, not its administrative officers. Major decisions regarding the editor’s employment should be made by this body with open discussion and time to hear from all interested parties. Some owners have found it useful to appoint an independent board to advise them on major decisions regarding their editor and journal. - Editors should resist any actions that might compromise these principles in their journals, even if it places their own position at stake. If major transgressions do occur, editors should participate in drawing them to the attention of the international scientific community. Eurasian Journal of Soil Science Editorial Board members and the Editor-in-Chief submitted articles are gone under the same reviewing process as the other authors gone. In the cases that a reviewer suspects undisclosed conflict of interest in a submitted manuscript or a reader suspects undisclosed conflict of interest in a published article (all authors are filling the ICMJE Form for Disclosure of Potential Conflicts of Interest at the submission time) Federation of Eurasian Soil Science Societies (FESSS) will follow COPE’s guidelines. Eurasian Journal of Soil Science is financially supported completely by the Federation of Eurasian Soil Science Societies and has no other sources for earning funds. Eurasian Journal of Soil Science accepts No advertisements in the site or even as a report article. 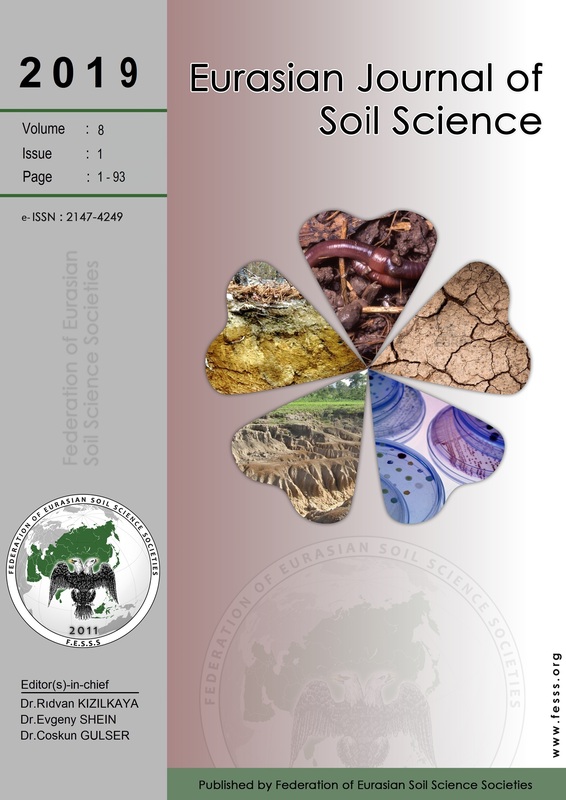 Eurasian Journal of Soil Science is published quarterly since 2014. All the content from the beginning to the end will be available for ever on Eurasian Journal of Soil Science’s own website. Also Eurasian Journal of Soil Science are included at DOAJ, EBSCOHOST, PROQUEST database.